Photo Credit: Tuna Canyon Detention Station Facebook Page Photo credited to David Scott, the Scott Family, and Little Landers Historical Society. David Scott is the grandson of Merrill Scott who was the superintendent of TCDS. Photo circa 1941-1943. The structures were removed, but the oak and sycamore trees dating back to World War II still live on this site. 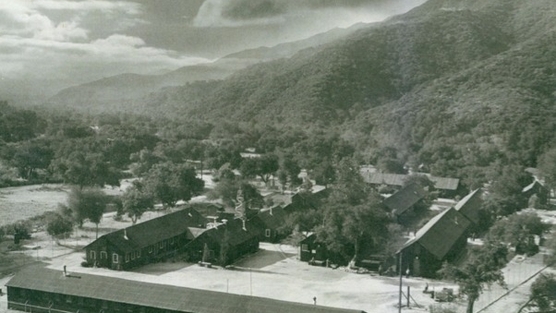 The Los Angeles City Council voted unanimously to support an amending motion by Council member Richard Alarcon to declare an approximate one acre live oak and sycamore grove as a historical-cultural monument at the former Tuna Canyon Detention Station in Tujunga in Southern California. The site was the U.S. Department of Justice internment camp for Japanese, German and Italian Americans during World War II. The live oak and sycamore trees date back to World War II when the internment camp was in operation. The Los Angeles Cultural Heritage Commission had recommended against monument status because the original internment camp structures were removed years ago to make way for the Verdugo Hills golf course. The site is now being planned by a developer for a housing development. Council mmember Richard Alarcon argued that Los Angeles has designated many monuments at sites where the original structures are gone, and he pointed out that trees have also been designated as historic. 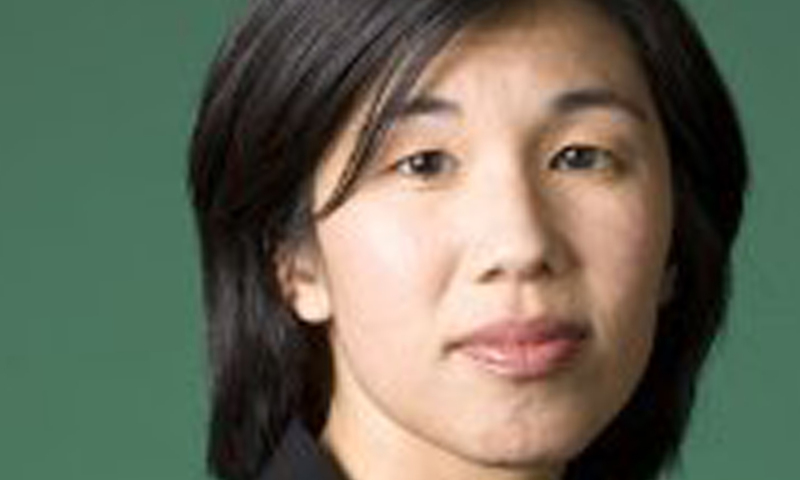 President Barack Obama has reportedly selected Nicole Wong as the White House's first Chief Privacy Officer. Wong received her law degree and a master's degree in journalism from the University of California at Berkeley. She was a partner at Perkins Coie law firm. After working for Google for eight years as a vice president and deputy general counsel overseeing censorship issues for products such as YouTube.com, she joined Twitter as its legal director in November, 2012. Wong's new role will be to advise the Obama administration on matters involving Internet Privacy. She will reportedly be a senior advisor to Todd Y. Park who was appointed in March, 2012 as the United States Chief Technology Officer and Assistant to the President. Todd Y. Park Photo credit: WhiteHouse.gov Prior to Todd Y. Park's latest White House post as the United States Chief Technology Officer and Assistant to the President, he was appointed in 2009 by President Obama as the Chief Technology Officer of the U.S. Department of Health and Human Services. Park is a graduate of Harvard, and co-founder of two health information technology companies. 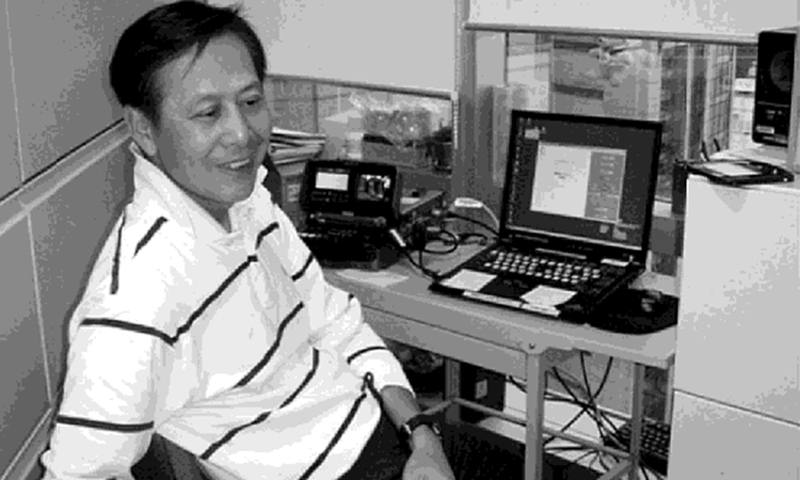 Network TV News Video Editor Eddy Li writes "My Journey Through Cancer"
Eddy Li globe-trotted the world for ABC News in a high-stress non-stop news video editing job from 1971 to 2009. When a sudden diagnosis of cancer changed his life, Li wrote his personal account on how he entered into the darkest tunnel of his life and emerged, a more vigilant and environmentally aware individual. Today, as a cancer survivor and a retiree who now enjoys a healthier and more fulfilling life, Eddy shares what he has learned about our world's increasingly hazardous environment and how you can protect yourself from its toxicity. AsianConnections' Suzanne Joe Kai chatted with Eddy about his new book, "From A Great Escape to a New Beginning - My Journey Through Cancer." Suzanne: Congratulations on beating your Stage 3 cancer. When you were a news video editor with a busy globe-trotting life for years, can you share with our readers what your life was like, and how and why you have changed your lifestyle? Eddy: In the eyes of an average audience, network news looks glamorous. It was indeed, at least during my days. But behind the scenes of its glamor, there went a stress-filled working environment. That is compounded by the time difference between Asia and the Americas. I joined ABC News in October 1971. I retired in October 2009. 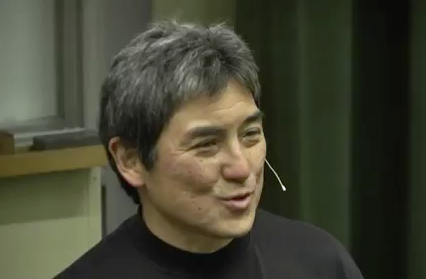 We received alot of positive feedback to our posting of Guy Kawasaki's Spring, 2013 talk at the UC Berkeley Startup Competition (Bplan). The former chief evangelist of Apple and co-founder of Garage Technology Ventures is such a good speaker that you wanted to hear more of him. He was the keynote speaker at the first Donald W. Reynolds Governor's Cup Business Plan Competition at the University of Central Oklahoma in Edmond in 2005, and its timeless. You can click on the top blue headline to the full story and his video or click here. In his keynote, "The Art of the Start" he gives insight into the characteristics that make a successful start-up. His first test is, "Are you making "meaning?" He finds that the start-ups which have the highest chance of success are created by people who have a mission. He says they want to make "meaning" and not money. He feels the entrepreneurs who more often succeed are those who want to change the world. They want to make the world a better place, to improve the quality of life, to right a wrong, to fix something and change it to make it better, or they want to prevent the end of something good. He urged his audience of students to be "Prototypers" not typists. He was referring to entrepreneurs who create things, or develop something, versus those who merely write a business plan with a mission statement. Kawasaki says, "Get going." "As an entrepreneur - Think different. Don't look at the existing status quo. Don't look at what is successful now, except to say how can I leap frog that? How can I change the world. How can I shift paradise? How do I get to the next curve? How can I create the next curve?" Second, "You should polarize people. Create products and services that you love." 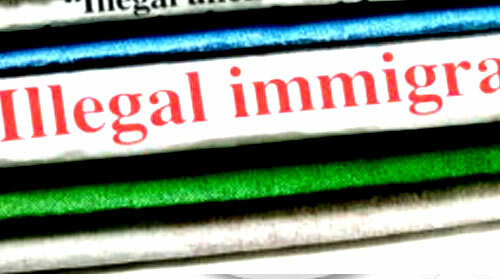 The Associated Press Drops the Term "Illegal Immigrant"
The Associated Press announced Tuesday, April 2, 2013 that it will no longer use the term "illegal" or "illegal immigrant" to describe a person. Senior Vice President and Executive Editor Kathleen Carroll wrote in a blog post that the decision was part of the company's attempt to rid their Stylebook of labels. She did not specify which term the Associated Press would use instead. The AP Stylebook states that the preferred term is “illegal immigrant” -- but that “illegal” should not beused as a noun. The National Association of Hispanic Journalists advocates the use of the term “undocumented immigrant” or “undocumented worker.” A campaign headed by the Applied Research Center and its news site ColorLines – called “Drop the ‘i’ Word” – considers “illegal” a slur and is calling on media outlets across the country to take a pledge to stop using the term.